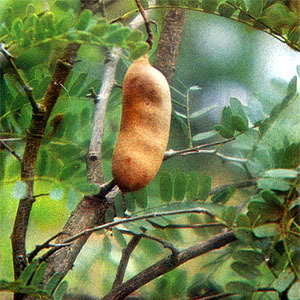 Sampaloc ( Tamarind ) – Scientific name: Tamarindus Indica L.
Sampaloc is a fruit tree found throughout the Philippines. Sampaloc fruit is used as a laxative, for bilious vomiting, and against cholera. It is also a refrigerant, and used to reduce fevers. The bark is astringent and tonic, and used for asthma and amenorrhoea. The leaves are used to destroy worms in children, and are useful for jaundice. In the Philippines, the bark, leaves, flowers, fruits, and seeds are used medicinally in the way it is used in other countries. Fever: Macerate pulp or ripe fruit in water, sweeten to taste, and drink. Laxative: Pulp ia considered a mild laxative because of the presence of potassium bitartrate. Eat pulp of ripe fruit liberally and follow with plenty of water. Asthma: Bark; chop and boil a foot-long piece of bark in 3 glasses of water for 10 minutes. Adults, 1 cup after every meal and at bedtime; children, 1/2 cup 4 times daily; babies, 2 tbsps 4 times daily. Decoction of ash: For colic, indigestion; as gargle for sore throats, aphthous sores. Poultice or lotion from bark applied to ulcers, boils, and rashes. Poultice of leaves to inflammatory swellings of ankles and joints. Ash is considered astringent and tonic; used internally as a digestive. Ash preparation: Fry the bark with common salt in an earthen pot until it turns to powdered white ash; a heaping teaspoon of the ash to half-cup of boiling water; cool and drink for colic and indigestion. Decoction of leaves as postpartum tea; also used as a wash for indolent ulcers. Decoction of leaves used as an aromatic bath for fevers, puerperism, and convalescence. Pulp surrounding the seeds is considered cooling and a gentlelaxative. Gargle of tamarind water used for healing aphthous ulcers and sore throat. Flowers for conjunctival inflammation. Internally, as decoction or infusion, for bleeding piles (4 glasses of tea daily). Tamarind pulp considered preventive and curative for scurvy. This entry was posted in List of Medicinal Plants in the Philippines and tagged sampaloc, sampalok, tamarind on March 30, 2009 by Pinoy Herbs.